Joy to the World | Dr. Justin Imel, Sr.
My wife and kids hate me. Well, maybe that’s not entirely true – they just hate me this time of the year. You see, I love Christmas carols. A local station plays nothing but Christmas music from Thanksgiving to Christmas; if we’re traveling anywhere, we listen to those Christmas carols. I have some Christmas albums on my iPhone; I’ll turn on Bluetooth in the Prius, and I’ll play my Christmas albums (skipping the songs I don’t like in order to hear the ones I do). 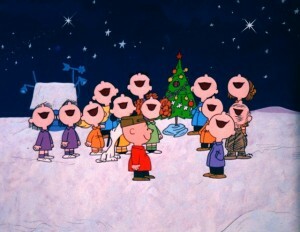 Ah, Christmas carols – how I love thee! As I near the end of the 30 days of Thanksgiving (yes, I know I should have been finished about a month ago), I want to thank God for Christmas carols. I’m not thankful that they drive the family crazy – that’s just an added benefit. I’m thankful for their rich theology. The rich theology in true Christmas carols reminds us of a God who became flesh. That theology points us, not simply to the Babe in a manger lauded as King by the angelic host, but to the Lord who demands obedience. That theology calls us from the cares of this world and reminds us of a Savior who loves us enough to come and die for us. That theology reminds us of what the Gospel is really all about. Think about the theology is some Christmas carols. This world of sin and death is made new through the Incarnation, teaching, death, and resurrection of our Lord Jesus Christ. Jesus stands as the representation of God’s love. With His birth, redeeming grace entered this world; after all, grace and truth came through Him. Jesus was not simply a Babe in a manger when He came from Mary’s womb; He is Lord. This is my absolutely favorite Christmas carol. I love the message inherent in the song: The little drummer boy could not bring great gifts to the King; he could only bring his talent. He brought his talent before the Lord and the Lord smiled. That’s what God expects of us. Deity, God Himself, left heaven and came to this world. He, as the Incarnate Deity, lived among men. Jesus, God in the flesh, endured the same temptations I do, and He can be a merciful and faithful High Priest. Did Mary know? Obviously, she knew a great deal, but I don’t know how much she knew. Still, the thought of holding the Great I AM in your arms is staggering. The thought of God being a sleepy Babe in your arms boggles my mind. These are my favorite carols. They remind me of a God who loves me, of a God who sacrificed for me, and a God who has saved me. I’m amazed that God would do that for a sinner like me. I’m amazed that He would even think about walking with me, let alone do so because He loves me. But, I know He does, for throughout my whole life He has walked with me. This entry was posted in 30 Days of Thanksgiving, Advent, Christmas, thankfulness. Bookmark the permalink.